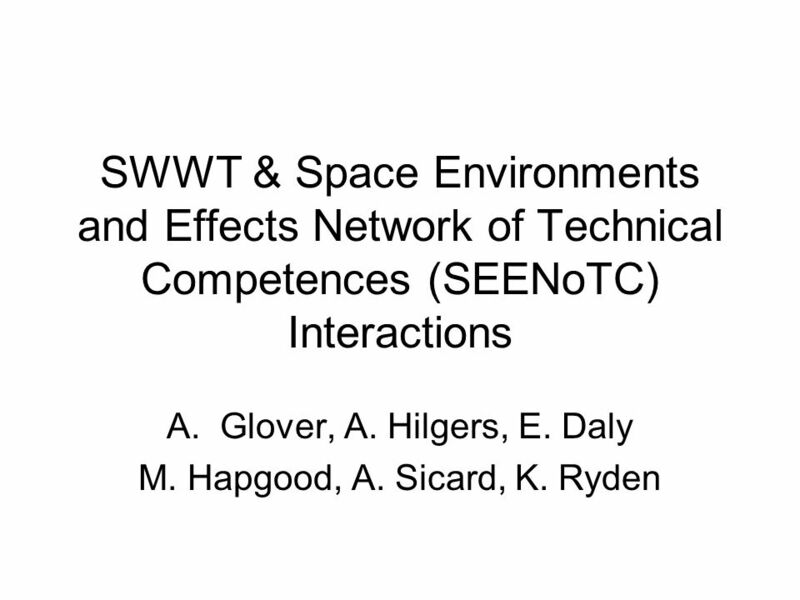 SWWT & Space Environments and Effects Network of Technical Competences (SEENoTC) Interactions A.Glover, A. Hilgers, E. Daly M. Hapgood, A. Sicard, K. Ryden. 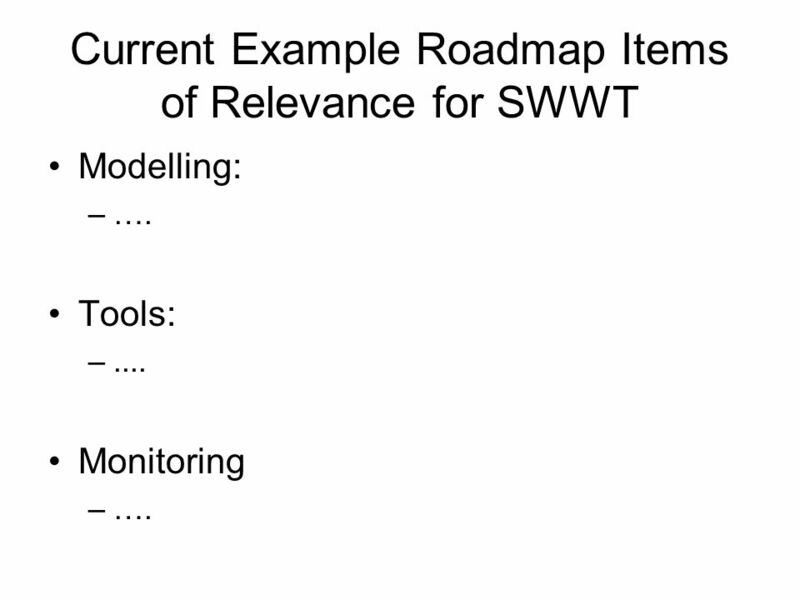 5 Current Example Roadmap Items of Relevance for SWWT Modelling: –…. Tools: –.... Monitoring –…. 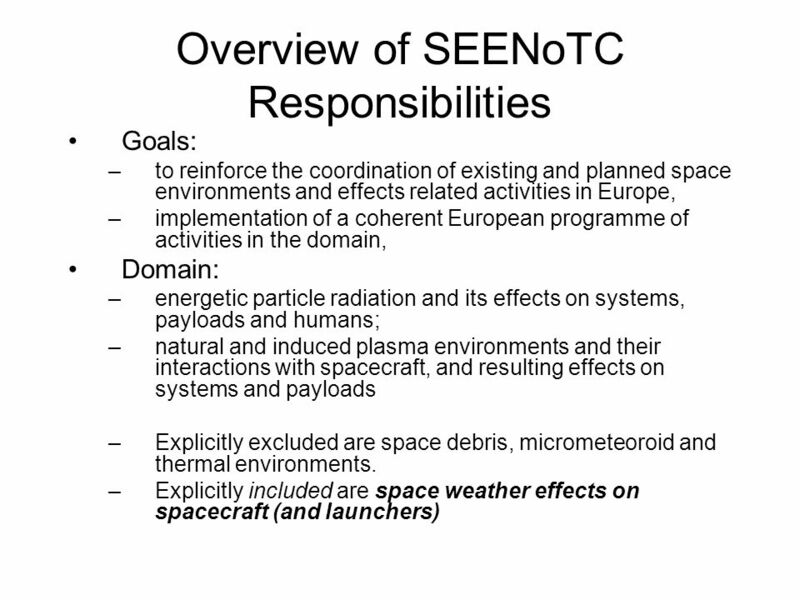 Download ppt "SWWT & Space Environments and Effects Network of Technical Competences (SEENoTC) Interactions A.Glover, A. Hilgers, E. Daly M. Hapgood, A. Sicard, K. Ryden." ESWW4, 5-9 th November 2007 Draft Proposal: Space Weather as part of an Optional Space Situational Awareness Programme A.Glover, E. Daly, R. Marsden, A.
SWWT SWWT meeting #24 ESWW5, Brussels 19 th Nov 2008, 18:30 to 20:00. SWWT Meeting, 2011 Royal Observatory Brussels, Belgium, June 2011 page 1 Report on behalf of the SWWT Topical Group Spacecraft, Aircraft and Launcher. 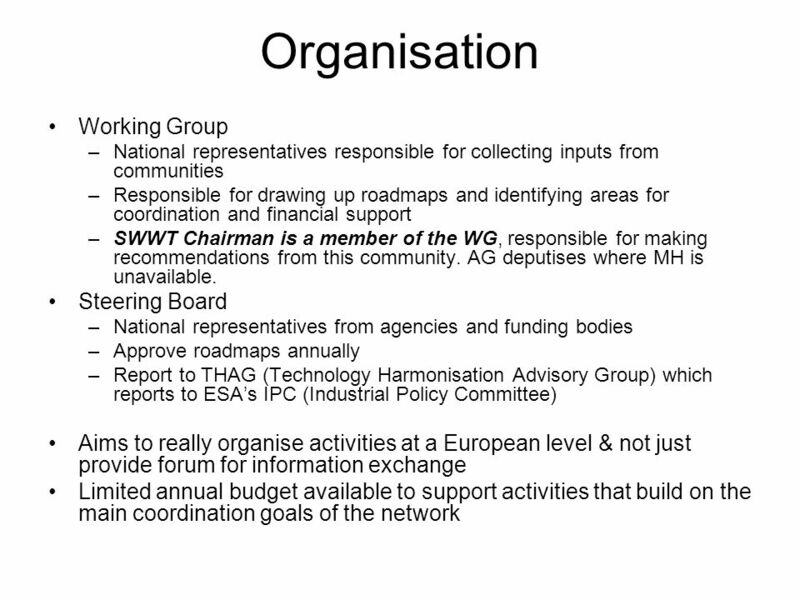 Mike Hapgood SWWT Plenary, Brussels, 18 June 2010 F7/F8 – the way forward Mike Hapgood with apologies that I could not attend. 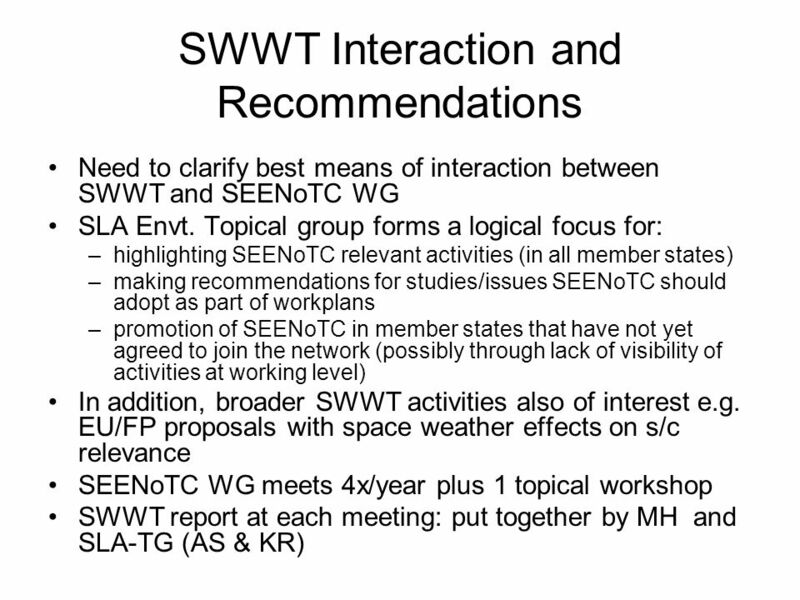 Space Weather Web Portal Coordination (Draft for Discussion) A. Glover, A. Belehaki. Strengthening statistical capacity in support of progress towards the Internationally Agreed Development Goals in countries of South Asia United Nations. 1 MINERVA - Towards a European Platform for Digitisation of Cultural and Scientific Content Belgrade CALIMERA Conference Belgrade, November 15 th, 2004. « HUMAN BIOMONITORING » Consultative Forum on Environment & Health 19th October 2005 in Luxembourg Update on developments. ERFP STRATEGIC PLAN Andreas Georgoudis 12 th Annual Workshop for NCs, , Antalya, Turkey. Heriot-Watt Energy Academy, 9 September 2014 Ocean Energy ERA-NET Karen Fraser, Scottish Enterprise Coordinator OCEANERA-ENT. COST on the go: the experience of an Italian COST Actions’ representative Piermaria Corona. ASPERA-2 WP2: Extension of the network and update of the status of Astroparticle Physics  Objectives  Structure  Tasks  Milestones & Deliverables Kickoff. S3 Project aim The main goal, thus expected result, of the S3 project would be to strengthen tools used for Structural Fund policies (SF), through the. Topical Working Group on Spacecraft, Launcher and Aircraft Environments November 6, 2007 Lippens Auditorium Prepared by Angélica Sicart. Sustainable Energy Systems Int’l H 2 Safety Conf, Pisa, Italy, 8-10 Sep IPHE projects focus on pre-competitive collaborative research, development. 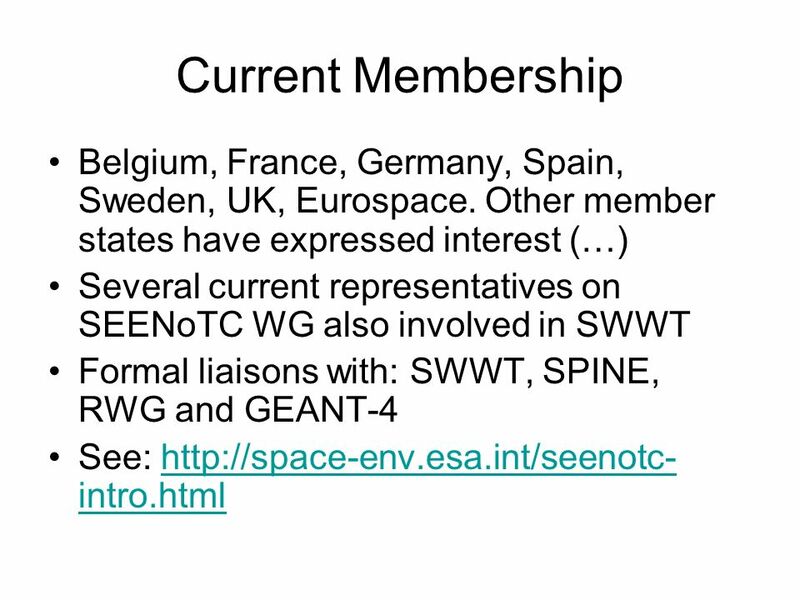 Welcome to the Fourth European Space Weather Week.